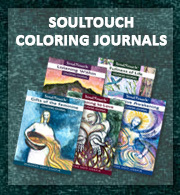 My daughter purchased SoulCards for me as a gift a couple of years ago because she knew that Deborah’s images were very much the feelings that I wanted to evoke from my own art, IF I could ever start painting again. The cards sat on a shelf for a long time, untouched. Upon receiving word that my mother’s breast cancer had spread to the brain and bones, I ran to the closet and instinctively grabbed the cards as I raced to the airport. I was raised in a conservative Southern Baptist home. My Mom was very open to all possibilities while my father is very traditional in his ideas and his faith. 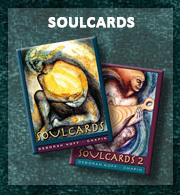 I made it very clear that these cards were to create discussion, awareness and insight. Each morning, Mom, Dad and I each pulled a card from the deck. We would have three cards laid out on the table to ponder for that day. Some days it was quite clear what feelings came up while other days we struggled for meaning but always we came together each morning and shared. It was my father who reminded me many times to pull the card for the day. 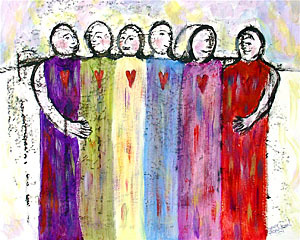 Sometimes a card would be pulled and tears would flow and other days it would bring such joy and hope. I made a copy of each of our cards and wrote all of our impressions, the date and what tasks we were tackling that particular day; radiation, doctors appointments, etc. It was amazing what cards were drawn and our ability to retrieve a new perspective. We learned so much in what would become my mothers last days. I made a book for Mom and Dad during Mom’s illness. We dated the book and who drew which card and also what was going on that day. It was so powerful. My father was showing everyone “our book”. Our very Southern Baptist family was amazed and inspired. 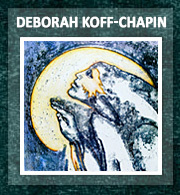 My mother’s most favored card was the woman exhaling the white dove (“Free As A Bird”). It made her so happy as she held it next to her heart. 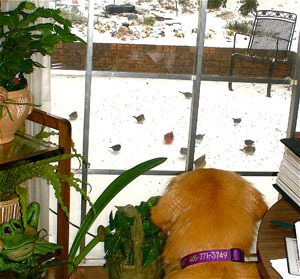 My parents had a large window in the kitchen where they loved to watch hundreds of birds and other creatures. They had hanging bird feeders from all the trees. Mom would save the nests and feathers from the yard and watched the birds bathe in the fountain from the kitchen. The day I was to leave for home, my flight was canceled due to an ice storm. Mom was quite ill and we sat at the kitchen table sipping tea. My dad threw bird seed out onto the patio and we watched the show of little greedy birds who paraded just for our amusement that afternoon. We were out of the cards on the last day of my visit. My mother passed away on December 11 of 2006, 9 days after I left. 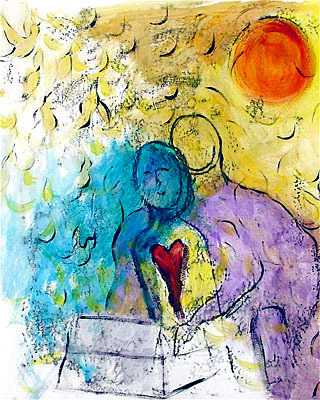 When Dad drew “Free As A Bird” after my mother passed away, there was no doubt in both our minds that Mom was transformed. Mom and I were best friends. I claimed only to be just like her but have now truly appreciated the many fine qualities in my father. I have come to see him in a completely different light during my mother’s illness and death. We truly DO wear each other’s colors. This painting was guided just as surely as if I had a hand on my elbow and is as different a painting as I have ever done. I was always fussing at my mother to put herself first when she was diagnosed with breast cancer. I wanted her to make time for creativity. Her mantra during chemo was “I Can Do This!” and she did! But I wanted her to Choose to Be First! Choose To Be Well! I kept hearing her voice on this day….. “So Stacy! Stop talking the talk and DO.” I got out all my touch drawing materials and released my sadness. My hand stroked in a lone figure of a girl and a figure watching silently behind. (Mom, I hoped) I wildly stroked and brushed the paint, not caring about the outcome and freeing my ego from the end result. I closed my eyes and when I opened them, burst into tears. I found that a purple arm reached around the young girl, the box showed up and out came all the yellow birds! My mom loved nothing more than yellow birds and told me before she died that she would come to me in the form of a bird. That would be our sign! What had started out as a sad and “blue” girl with a broken heart turned out to have full heart and a mother showing her a box of wonder! Could it be more beautiful??? 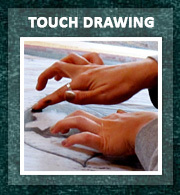 What I am most amazed about Touch Drawing is how it unfolds and appears before me. It reveals itself and I am in awe as I stand in front of what Spirit shows me.